Hello my hookah homies! I just wanted to start a pet thread, because I am a pet freak. I saw a picture of Nima's Shepherd and became inspired! I dont have access to my pics now, but after work tonight, for my hookah sesh, I will post a couple pics of my babies. Like "Butterstuff" my girlfriends new snake. She is a 13 foot long Reticulated python, Albino, Heterozygous for Lavendar albino. This girl has been sad since her too-young-to-care-for-her previous owner had to sell her... She's starting to come out of her funk though, and she ate my biggest rat I had for her last night! I'll take baby-step progress any day where she is concerned!! I also have maybe 14 tarantulas, a Parakeet, an adult female rat I call "Momma" and I also breed Dubia Cockroaches and Superworms. So pictures to follow tonight, was thinking I could get a pic or two during the mean time though from my fellow hookah hombres!! Thanks for looking!! Her name is Piper. She's a bro. Hahah Piper the bro. Awesome!! 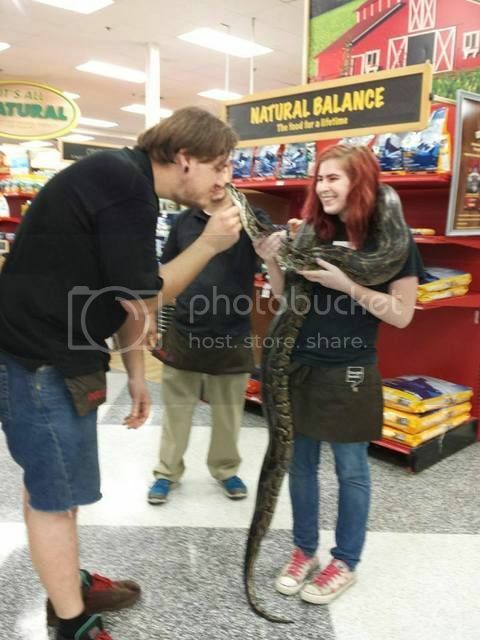 That's my boy being held by a co worker friend of mine one random day I worked at PetCo. He is fat. His name is Caber. He's bigger now, of course, but at that time he was about 10 feet and 75 pounds. lolz @ ferret mishaps and misadventiures!! That is why I named her Loki, the god of mischief. oh wait, can my hookah count as my pet? I feed her, wash her and take pretty good care of her. I have many 6-stringed pets, a 7-stringed pet, an 8-stri... oh wait, guitars aren't pets. I want a frenchie or a boston terrier so bad though. I had bostons growing up. Great dogs. Yes. Yes they are. I taunt my wife with pictures of them on Instagram all the time. She always responds with "so you stole him for me?" I have 2 bull terriers. The male is about 3 years old and weighs 30kgs. All white except for one ear and his nose. The female 2 years old and 18kgs. Brown and white. I love these dogs. The breed is so full of character and personality. I only have 2 pics on this phone. I'll post more when I have my hard drive on me. Little maise!! Mine and mainly my girlfriends cat. We only got her a few weeks ago. That's why I got pythons... My Caber can live to be 80 and still happy and healthy... If I'm lucky and I do my job right.. Last night he got a new personal best: He at a 20 pound rabbit! I didn't think it'd fit. He made it work, but now he ain't goin' anywhere for like a week!! fat!! That's my boy!! awwww so cute. I love cats. No matter where I am, I'm surrounded by animals. Khaleesi the kitty, Baxter the Corgi (family's dog), and Annie the lab (birth mother's dog). Awwww they are adorable! That kitty though I would hug her forever.